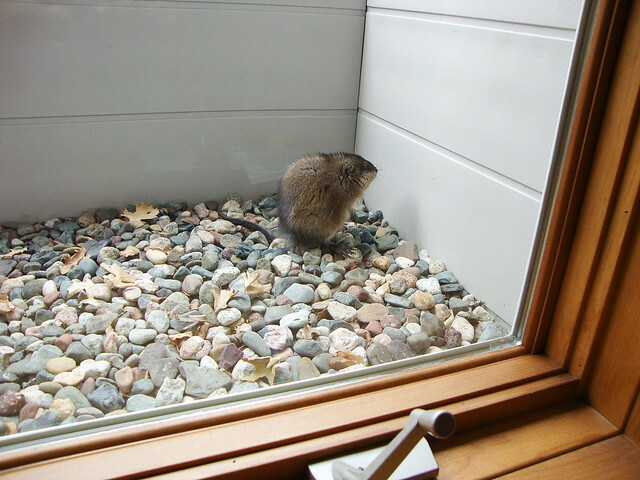 The other afternoon, I got a text from my dad that said, "There's a muskrat in the window well." At my parent's house, the bottom floor has 4 big window wells, two in the living room, and one in each of my sister and my bedrooms. They are 3+ feet deep and are deadly traps for all kinds of animals. There are always frog carcasses in the bottom on the rocks, and sometimes mice too. I know, a real pretty sight out in the window haha! My dad took a picture before he set out to free the muskrat. "Help me! I'm trapped!" The good news is that with a fishing net, my dad was able to scoop him up out of the window well and set him free. The little guy must have been disoriented though, because he tried to run back into the window well two or three times before my dad herded him back into the woods, down toward the lake. Aren't they creepy looking. I have to say if I was afraid of one animal it would be rodents. Maybe that is a whole kingdom or something of animals. Oh, and snakes of course.